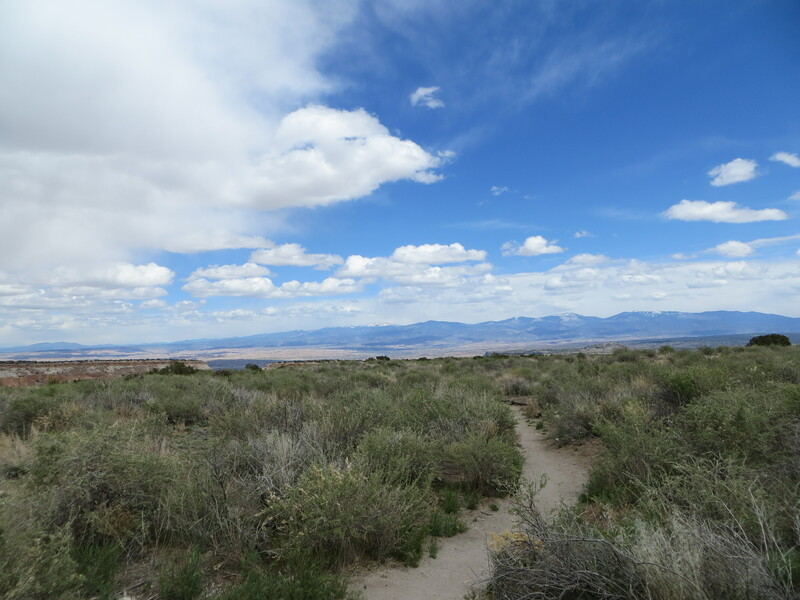 This is the first of a series of blogs about our rather ambitious trip to Taos, New Mexico last weekend. Ambitious because of the travel time involved for only three full days: travel to Seatac, 2 1/2 hour flight to Albuquerque, followed by a 2 1/2 hour drive to Taos. It was a trek. But well worth it. First, an update. Remember the tale of the hummingbird feeder? I am very happy to report that the little hummers like the new feeder. Two were vying for it yesterday evening. Makes me so happy. Anyways, Taos. We arrived last Thursday evening. 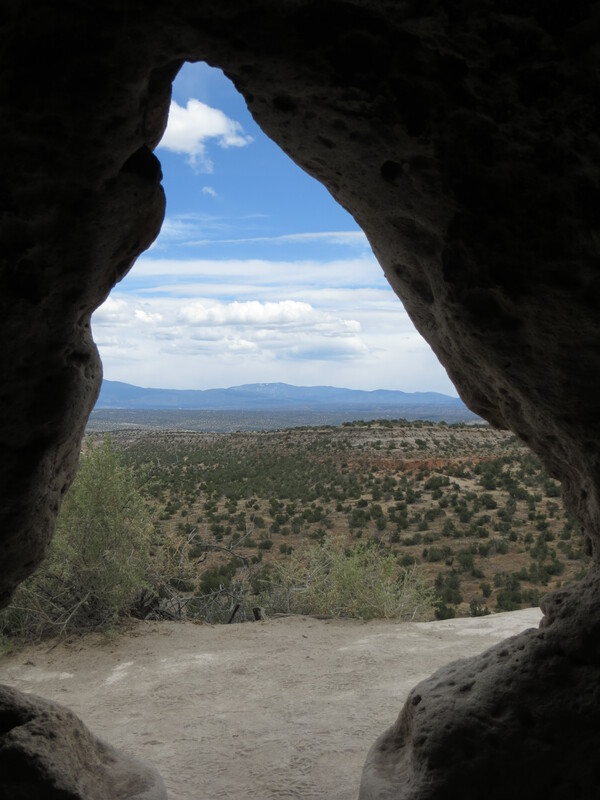 On Friday morning we headed to Bandelier, intent upon visiting Tsankawi and Frijoles Canyon. 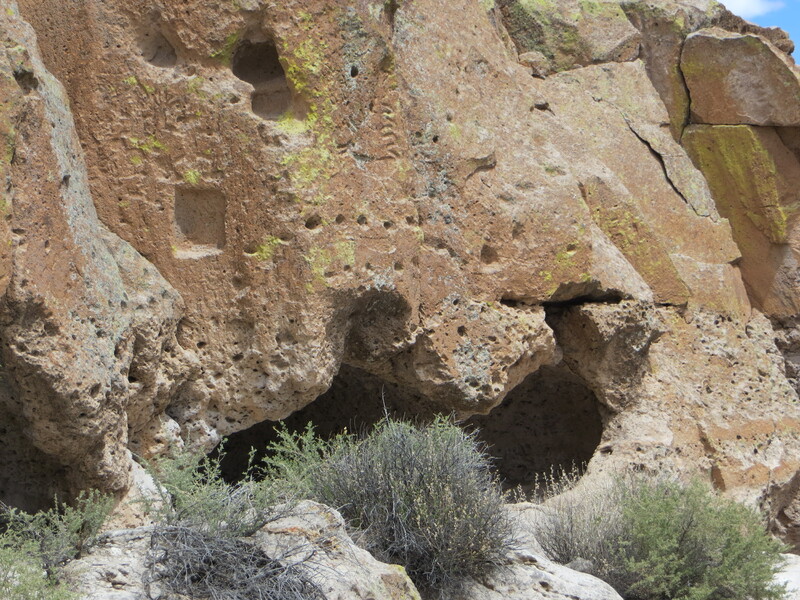 Bandelier National Monument was established in 1916 and encompasses 33,727 acres. Tsankawi (sank-ah-wee), our first stop, is a separate part of the monument, located twelve miles from the heavily visited Frijoles Canyon. 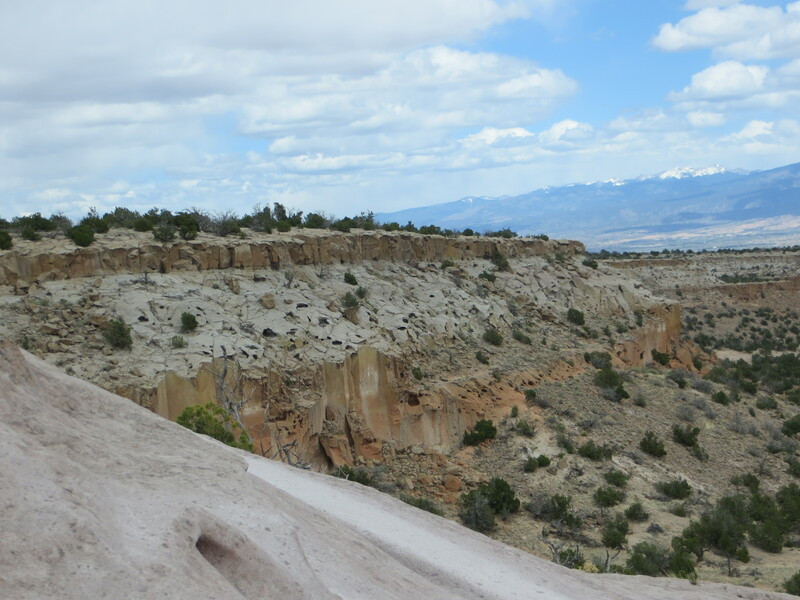 Of course, on a Friday in April one doesn’t have to worry about an abundance of visitors in Frijoles Canyon, which I’ll discuss in a separate blog. The reason we elected to start at Tsankawi, knowing that our visit there would limit our time in Frijoles Canyon, was because it was noted to receive fewer visitors and seemed to offer all that we were looking for: a 1 ½ mile walk along a mesa viewing cavates (pronounced cave-eights), petroglyphs and the remnants of the village itself. We were not disappointed. Historical information shared in the post was taken from the fantastic little walking tour brochure provided at the trailhead. It set us back fifty cents. I love stuff like that. What a deal!! 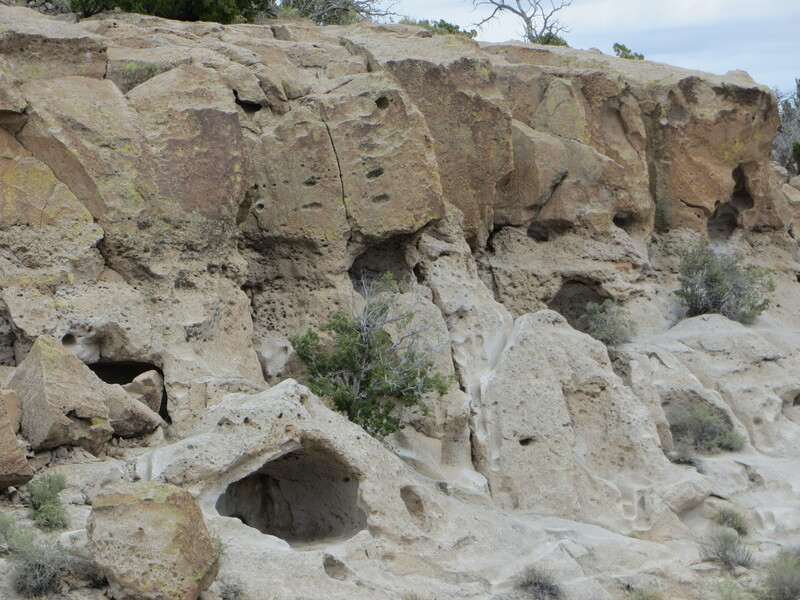 In the 1400’s, Tsankawi was home to the Ancestral Tewa Pueblo people. Today their descendants live in nearby San Ildefonso Pueblo. 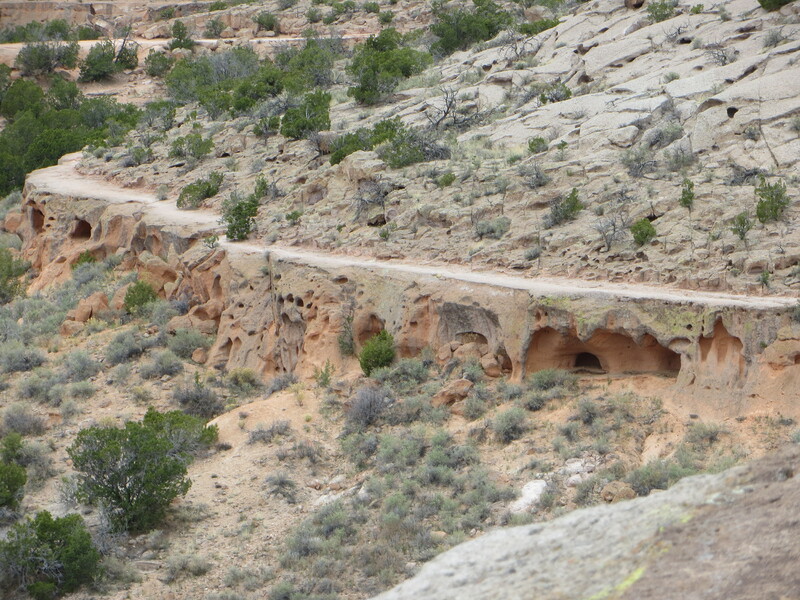 The Ancestral Pueblo people built homes of volcanic rock and adobe, cultivating fields in the open canyons below. 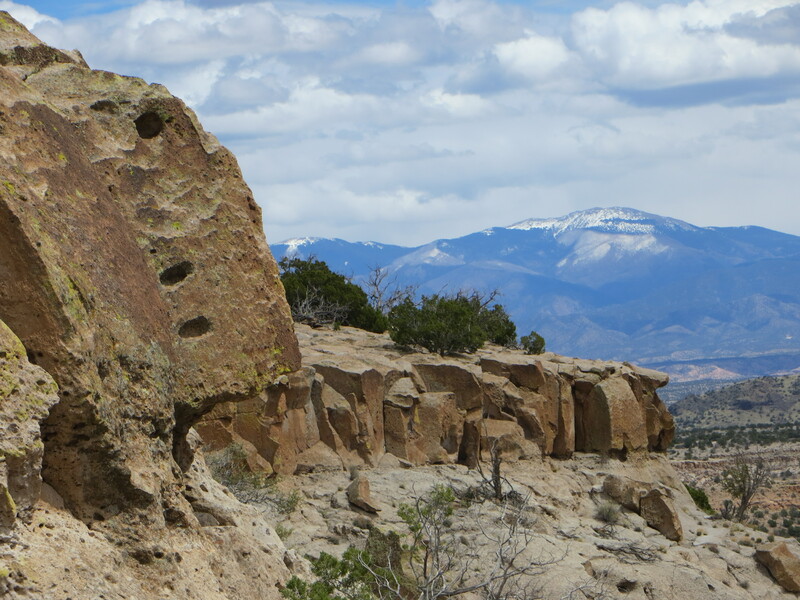 A little over a million years ago Jemez Mountain erupted several times, covering the surrounding area in a thick layer of volcanic ash. Once compacted, the ash formed a rock known as tuff. 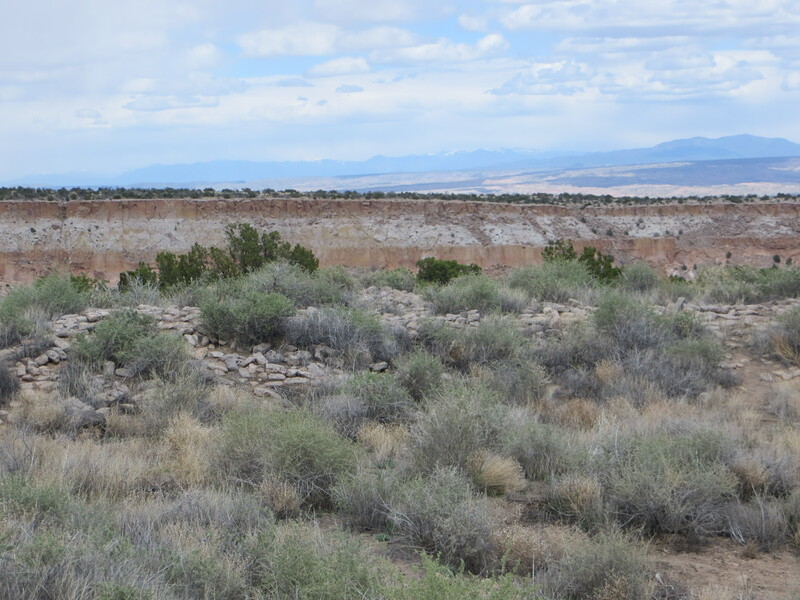 The thick layers of tuff created a plateau that was easily cut by streams, leaving flat mesas and steep-walled canyons. 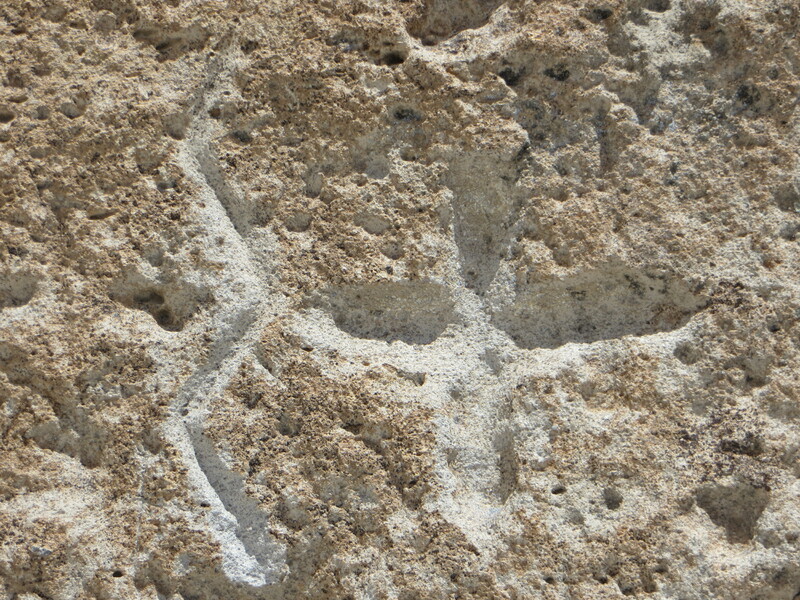 This tuff provided stone blocks for the construction of homes. 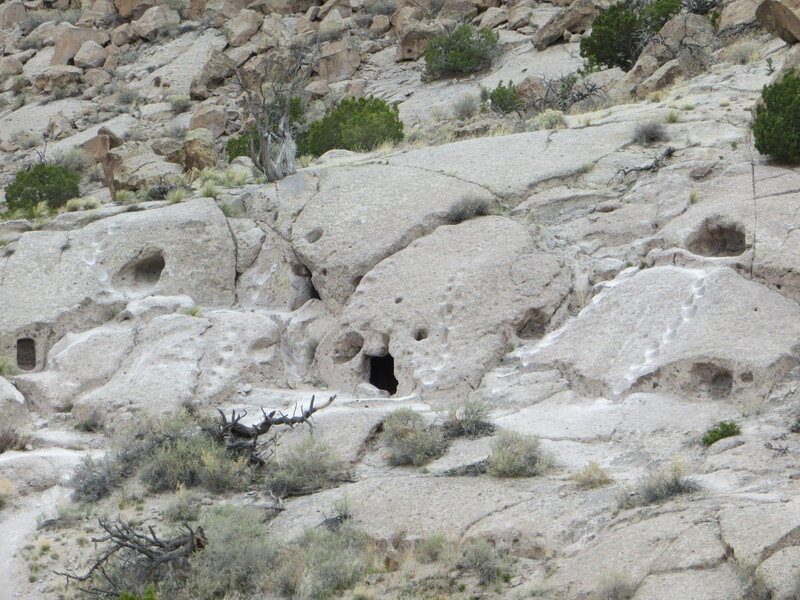 The tuff was soft and small rooms (cavates) could be carved out using harder stone tools. 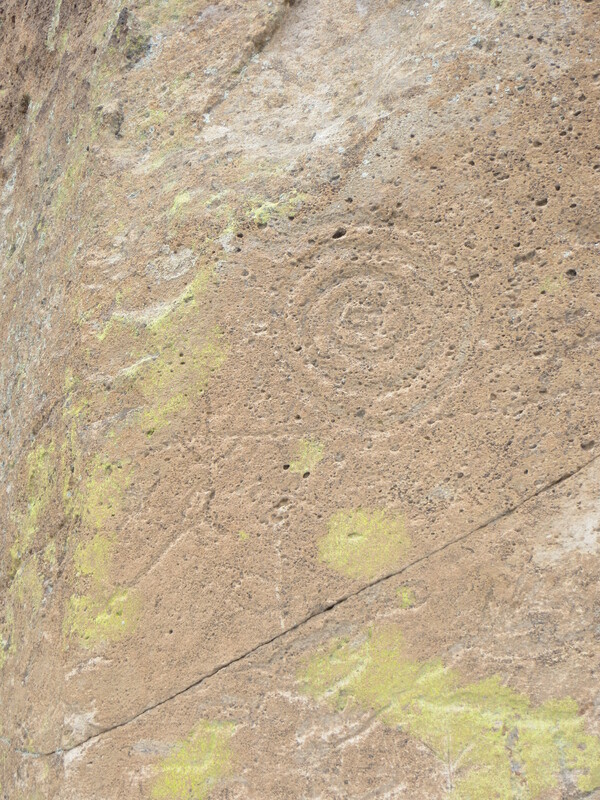 Not only are the cavates evidence of the Ancestral Pueblo population, the footsteps of the people themselves carved routes across the landscape. 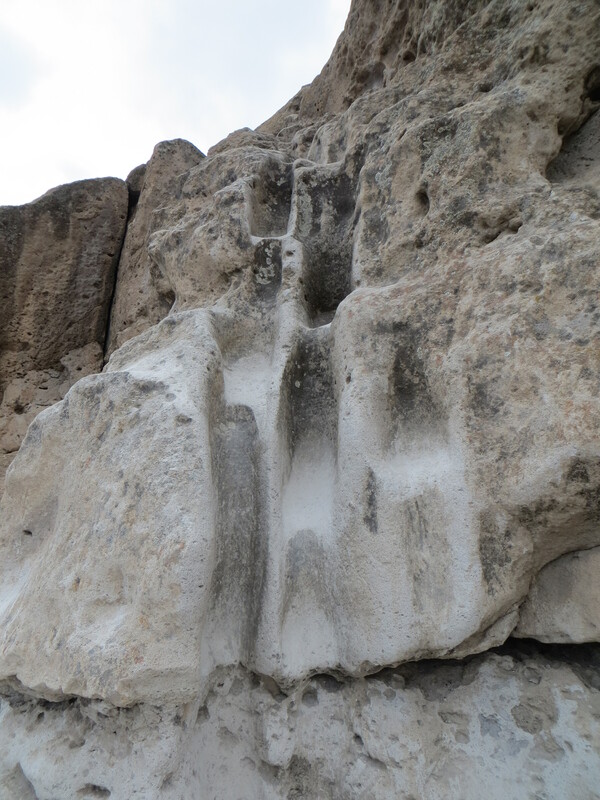 Walking barefoot or in sandals from their mesa top homes to the fields and springs in the canyon below wore deep impressions into the soft stone. 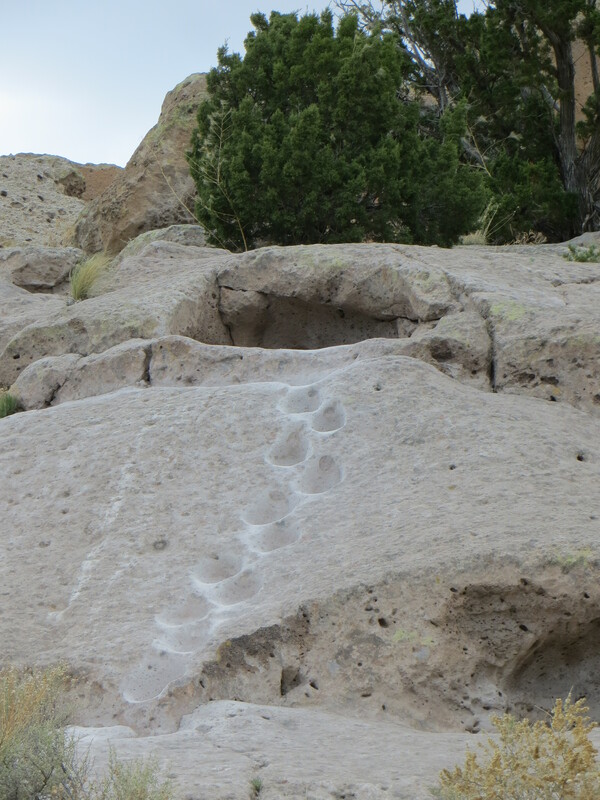 These trails have been worn even deeper by present-day visitors. It is impressive, to say the least, to see the paths worn by those who lived here thousands of years ago. 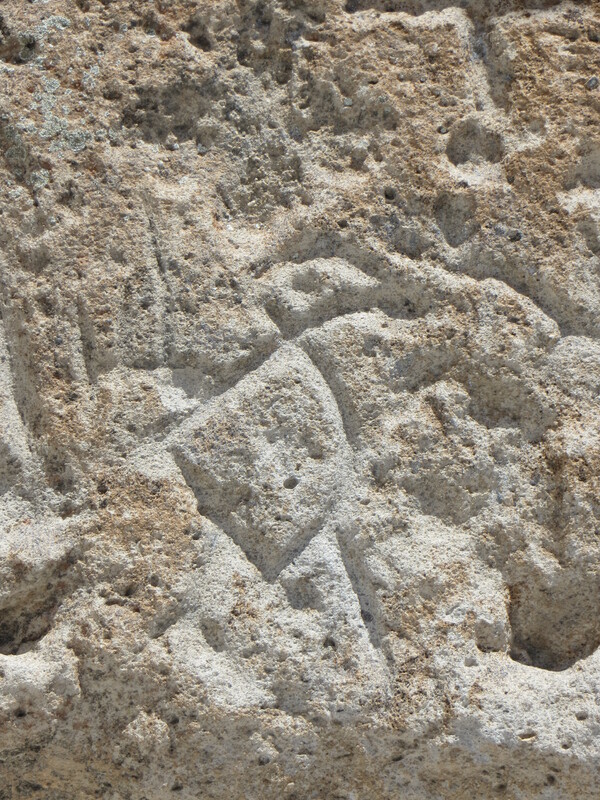 Petroglyphs litter the walls of Tsankawi. 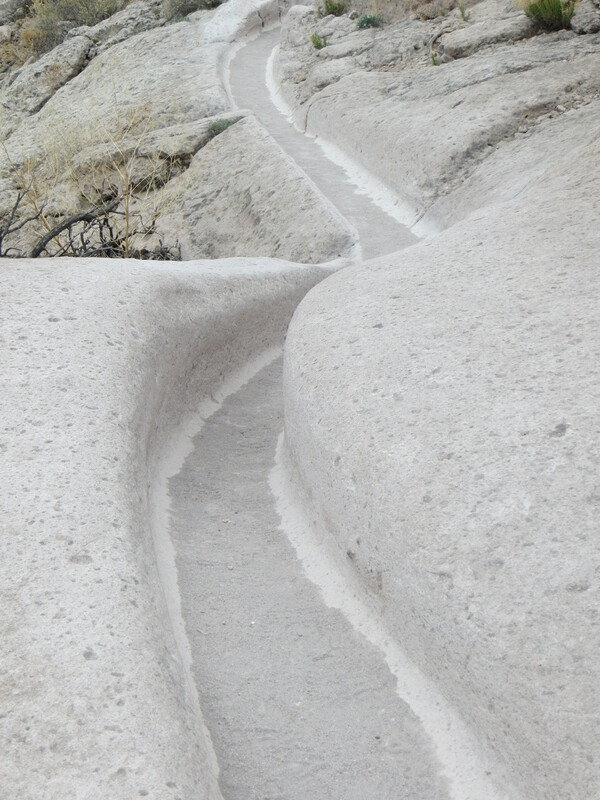 The village of Tsankawi contained about 275 ground-floor rooms. The structures were one to two stories high. Minimal excavation of the Tsankawi village has occurred. Layers of soil, roots and rock protect the buried site. 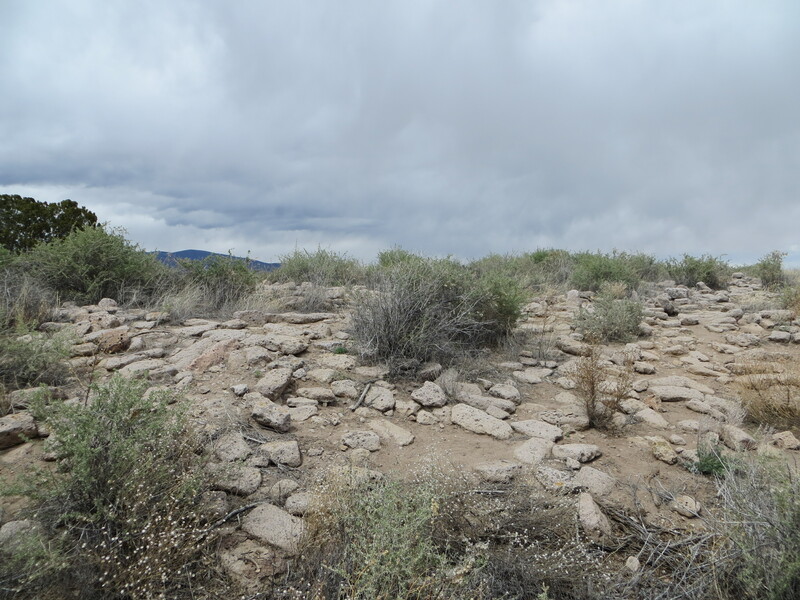 San Ildefonso Pueblo indicated that they preferred that the homes and belonging of their ancestors remain untouched. Though the area may seem desolate as you stand on top of the mesa the people of Tsankawi were not isolated from the rest of the world. Trade brought items such as live parrots, copper bells and seashells from distant places. The bulk of the stone structures built at Tsankawi were built against south-facing walls to take advantage of the sunlight. Most of the caves had small masonry buildings, known as talus pueblos, constructed in front of them. The thick stone walls exposed to the direct rays of the sun capture and radiate heat in the winter. Movement from the cavates to the mesa top pueblo would have been constant. 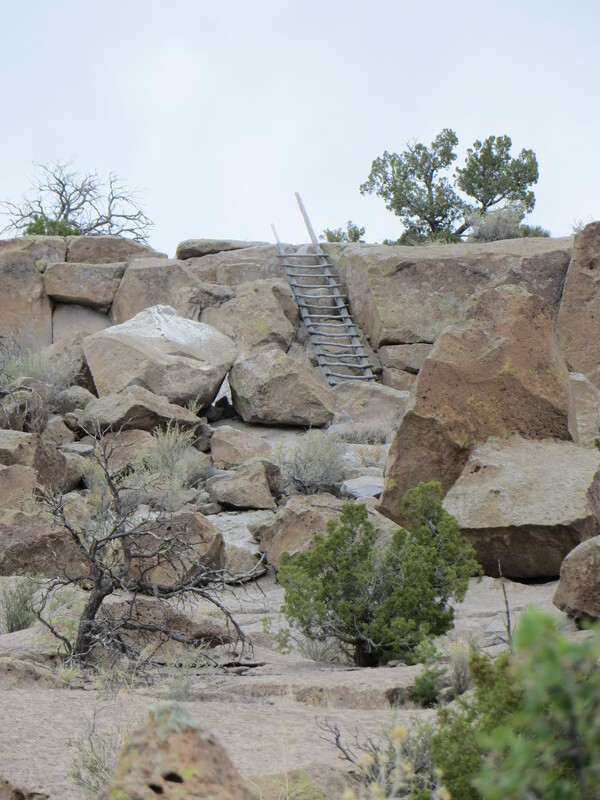 Stairways or hand and toehold trails were cut into the stone providing safer, easier access to the mesa. The canyon bottoms would have been covered with agricultural fields. The ground was first softened using a hoe, a smooth flat stone attached to a straight limb. Seeds were planted using a digging stick. Seeds for corn, beans and squash were mixed as growing seedlings could use each other for support and shade. The crops were dependent upon summer rainfall, most which occur in afternoon thunderstorms in July and August. We spent a good couple of hours at Tsankawi. It was an amazing experience. To imagine that society back in the day…surviving, prospering. It’s not clear when the Natives dispersed from this location, or why. Could have been drought, resources could have dissipated. But, at it’s height…people climbing up and down those cliffs, tending crops in the valley…it must have been an amazing sight.